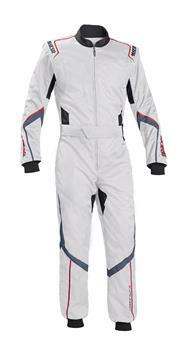 Sparco Racewear - Karting Suit - Robur KS-5 UNIVERSAL - Lesher Motorsports, Inc. 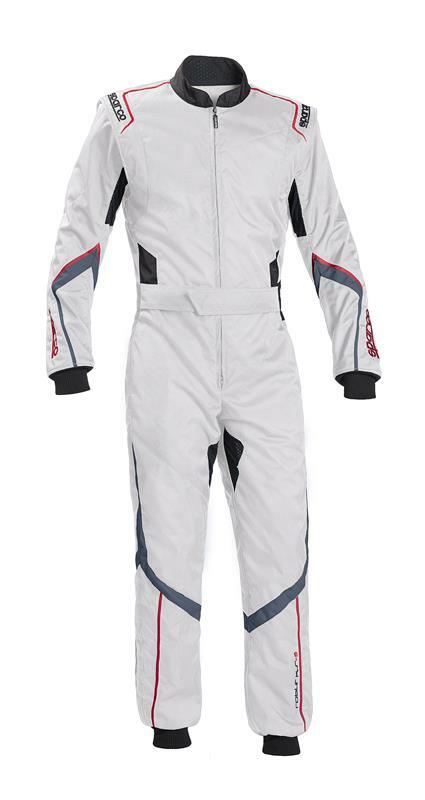 The ROBUR KS-5 kart suit is made from CORDURA fabric. COMPOSITION: Polyamide CORDURA. Two-layer sandwich with overall weight of about 480/500 g/m². CHARACTERISTICS: The ROBUR KS-5 suit has two layers, and complete armholes with a large elasticised back panel to improve comfort. There are perforated high resistance CORDURA inserts at the sides and bottom. Elasticised perforated panels at the armpits, inner leg and outer thigh allow the suit to breathe and thus minimise the condensation of sweat and improve comfort. The whole neck area can breathe thanks to the use of both the perforated materials used in making the suit. Concealed zip, pockets and classic belt. Preformed sleeves.